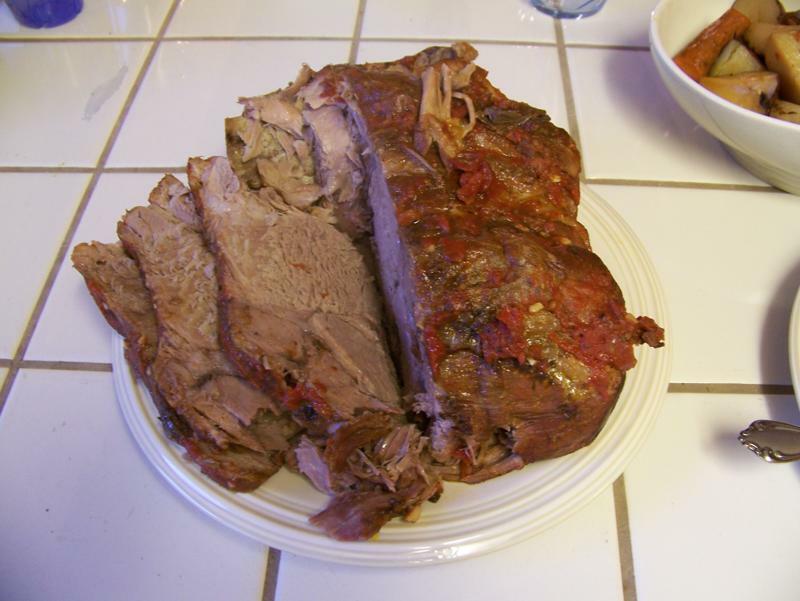 A few months ago Raley’s had whole bone-in pork shoulder roasts on sale for $0.97/lb. in the twin pack. 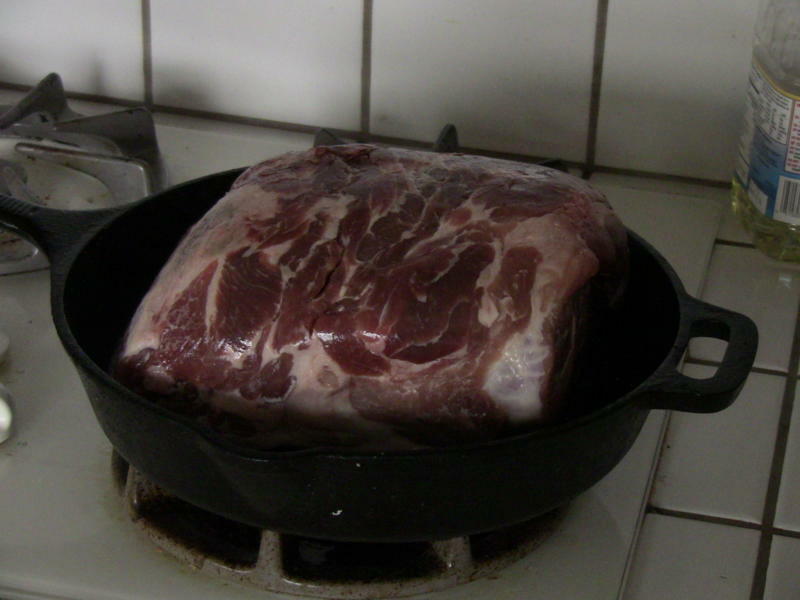 If you are familiar with this cut of meat, you know that two shoulder roasts is a lot of meat—about 14 pounds total. But it was such a great deal that I just couldn’t pass it up. I took my roasts home, stuck one in the freezer, and made carnitas with the other (recipe to be posted in the future). A few days ago I retrieved the frozen roast from the bowels of my freezer and stuck it in the fridge to thaw. 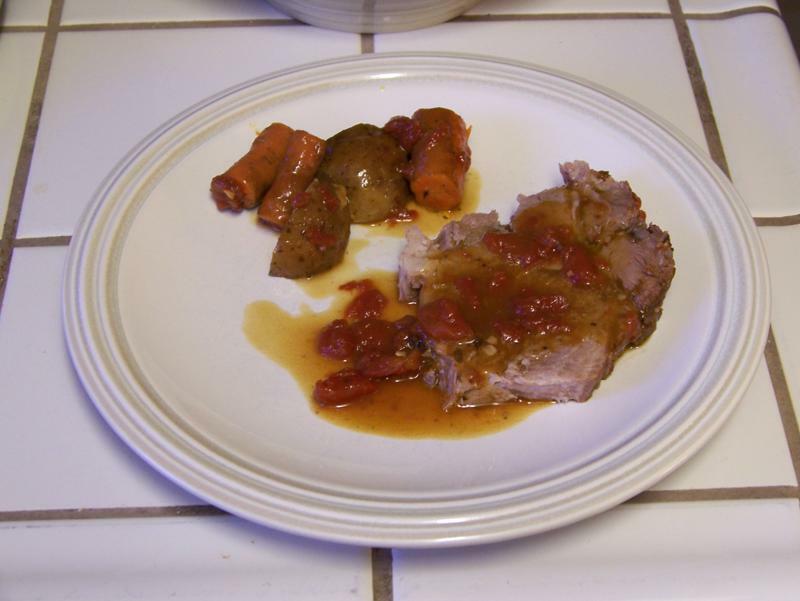 Using some basic ideas I saw on America's Test Kitchen, I added my own cooking instinct and came up with this meal, intending it to be a stepping stone to the final recipe. But after serving it to my family, the test recipe became the final recipe. Keanna had at least three helpings and both Robbie and I loved it. 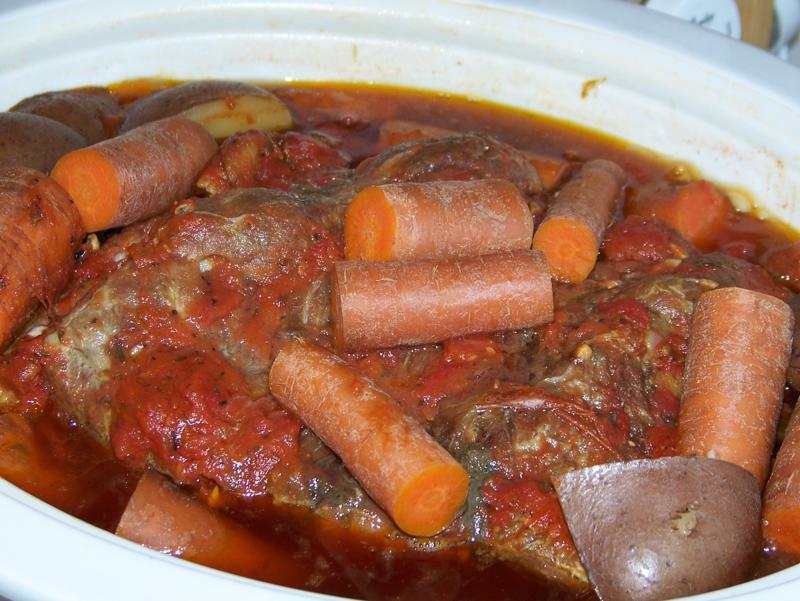 There are three keys to a successful pot roast. First, sear the outside of the meat before putting it in the slow cooker, then deglaze the pan for maximum flavor. Second, cook it low and slow. Pork shoulder is a tough cut of meat. It needs time to allow the connective tissue to break down. Third, don’t add too much liquid. This is a mistake that a lot of people make. The roast itself will let out a lot of juice. I have included quantities in the recipe, but use more or less carrots and potatoes depending on how much room you have in your slow cooker. You could also add parsnips and/or onions. I always end up with more meat than vegetables. No problem—I just serve leftover roast with sautéed or roasted vegetables. 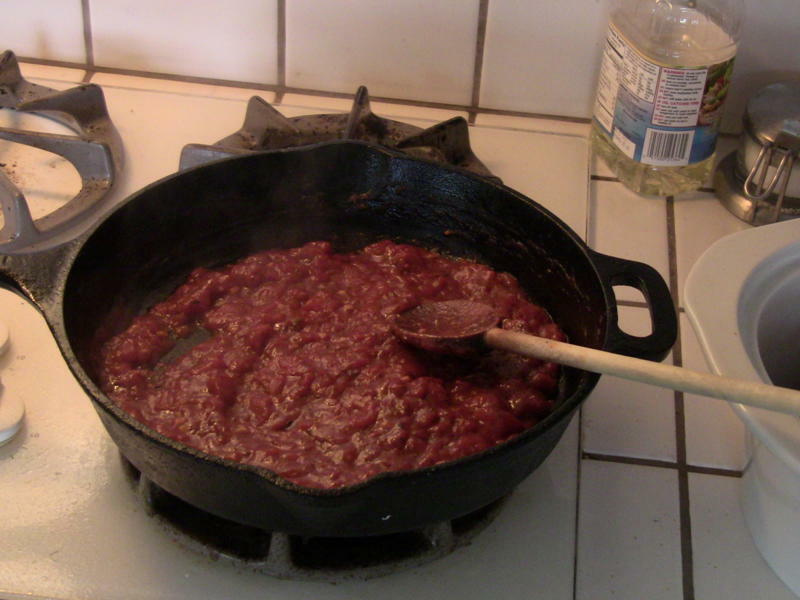 In large skillet, preferably iron, heat vegetable oil over medium-high heat. Once oil is hot, add roast, sear on all sides. 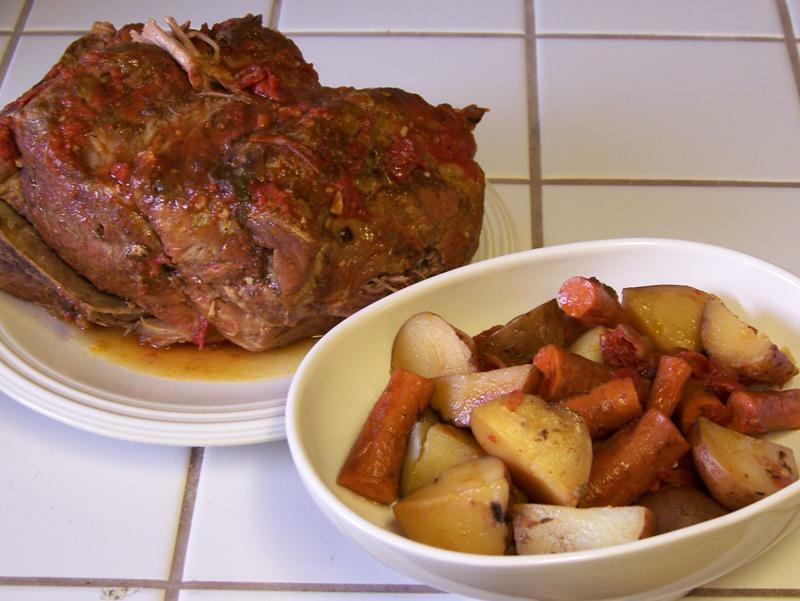 Move roast to crock of 5-6 quart slow cooker. Add garlic to oil left in skillet and stir until fragrant. This may take only a few seconds. 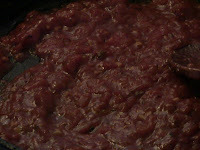 Add tomatoes and scrape bottom of skillet to deglaze. 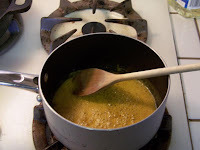 Add Worcestershire sauce, bouillon, thyme, salt, and pepper. Stir to combine. 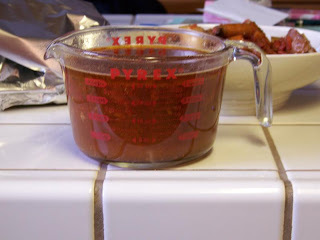 Reduce sauce over medium-high to high heat until really thick. You should be left with less than 2 cups. 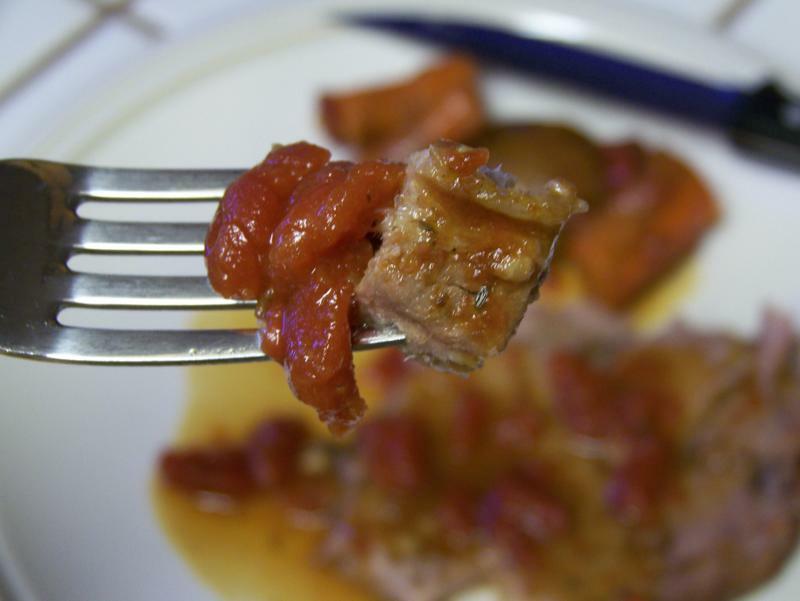 Pour tomato reduction over roast and down sides. Place potatoes and carrots around and on top of roast. Notice how much liquid came out of the roast. Remove carrots and potatoes to platter, keep warm. 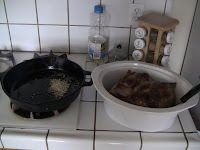 Transfer roast to cutting board or platter, wrap with foil, and let rest. 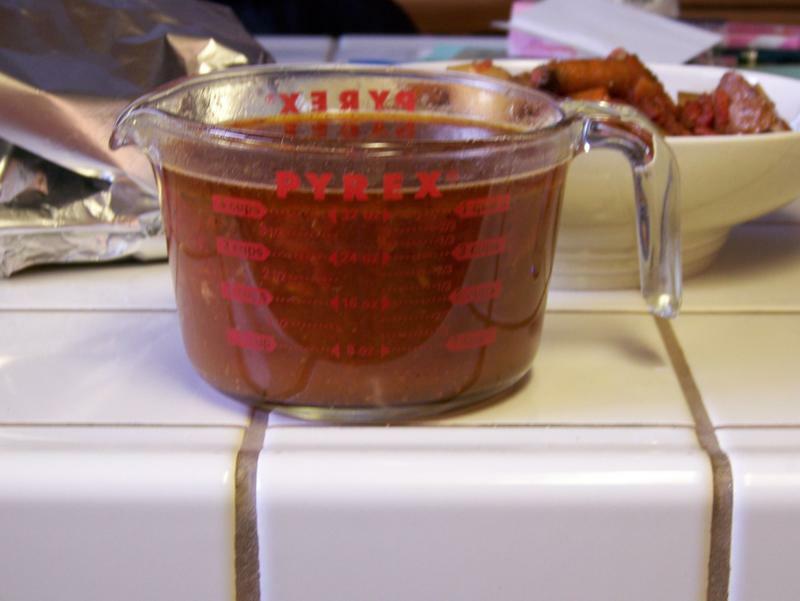 Meanwhile, pour juices into bowl or measuring cup (should be about 1 quart). 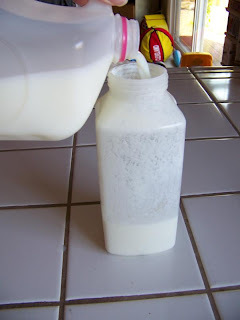 When fat comes to top, skim off, reserving 2 Tbsp. Place reserved fat in medium saucepan over medium-high heat. Add 2 Tbsp. flour. Stir until bubbly. 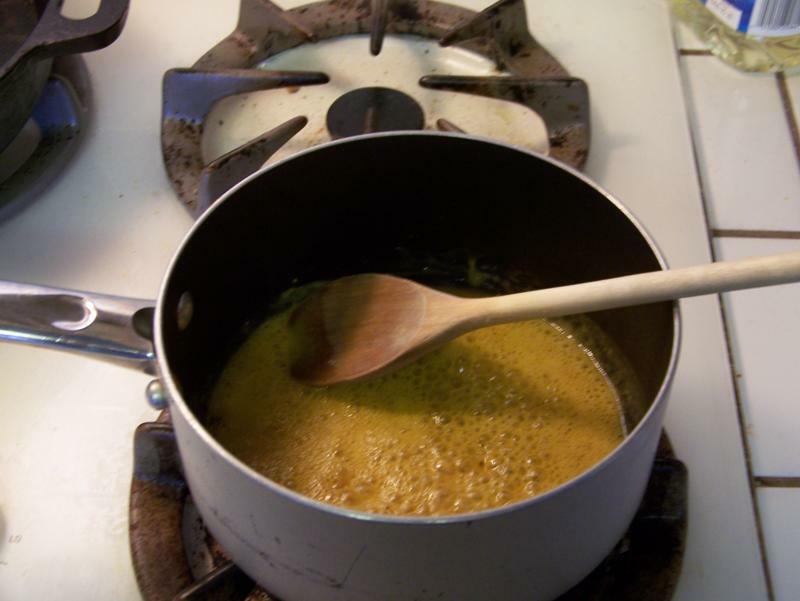 Add cooking juices; bring to boil, stirring constantly. Remove from heat. Slice roast across grain into thick slices. 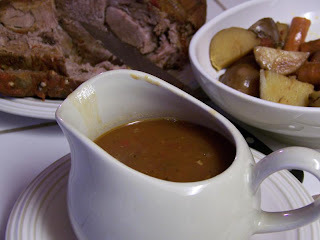 Pour gravy over roast and vegetables. Serve with crusty bread to sop up extra gravy. 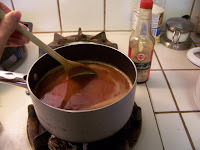 A couple weeks ago, Sumiko shared her Tangy Chicken Tortilla Soup recipe. I have to admit that I've never had it before, but it looks delicious and I'd like to try it! However, in the meantime, here's my version of Chicken Tortilla Soup. It's not tangy - more sweet, but it is delicious! It was given to me by a friend at church when I got married and it's one of the few soups my husband will eat (he's not a soup person). This is a great meal if you don't have a lot of time. It reheats great, so when I worked outside of the home 40 hours a week, I used to make this the night before and then just reheat it when I got home from work. Sometimes I make a double batch and freeze half for another time. In a large saucepan, combine all ingredients except chicken. 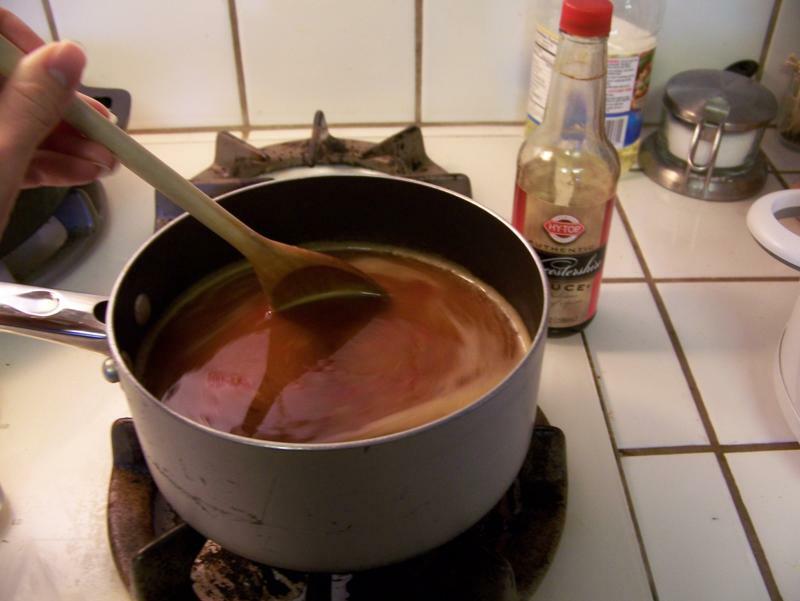 Bring to a boil; reduce heat, cover, and simmer for about 10 minutes. Add chicken and simmer for an additional 5 minutes. You can eat it as is or serve it with tortilla chips, avocado, sour cream, cheese, green onions, and/or cilantro. I am definitely not an organizational wizard. If you could see my desk right now, you would agree. I know. I could post a photo of it, but I’d rather not. From reading How to Organize Your Life books, I’ve come to the conclusion that my cluttered house and disorganization is a result of my desire for perfectionism and efficiency. I know, it sounds oxymoronic, but hear me out. If I can’t finish an organization project in one sitting, I feel like it would be a waste of time to start it. Consequently, I am very organized with small spaces since they can be tackled in very little time. For example, Robbie’s underwear and sock drawer is always in order—boxers folded on the right, socks paired on the left. My silverware drawer has all the salad forks facing one way and the dinner forks facing the other (they used to be perfectly stacked and nested until I received a few more place settings and they no longer really fit in my silverware organizer). An example of that perfectionism--all the mug handles point the same direction. But despite my overall lack of organizational abilities, I have a very organized kitchen. I’m not saying it is always clean and clutter-free, for that is hardly the case. My husband is always worried that I’m going to trip over the parking lot full of toy cars the boys have built in front of the stove, and somehow one of the counters always ends up collecting miscellaneous papers. Not to mention the dirty dishes I can’t get to until the kids are in bed. But when we moved into our house, I was very intentional about where I put things. I have a very nice layout that is conducive to a well-organized kitchen. But I understand that a lot of people have to work with what they have. Our first kitchen was a small galley-style apartment kitchen. We then moved to a house with a U-shaped kitchen. Neither of those were ideal for organization and I ended up storing things in the linen closets and on bookshelves. If you have a kitchen like this, organization is all the more important so you can maximize the space and work efficiently. Kimiko will talk about how she stays organized in her small kitchen in a future post. For now I want to share some simple basics, then next week I will show you how my kitchen is organized. First, think logically. Whenever other people are using my kitchen and looking for things, I tell them to ask themselves, “Where would I use that?” then look there. You’ll see what I mean in my next post. Second, think of your kitchen in terms of zones. You need the following zones: cooking, food prep, cleaning, food storage, and serving/staging/storing. Some kitchens have a nice area for a business zone (phone, phone books, stationary, etc. ), but mine does not. If your kitchen does not have a specific place designed for these items, try to keep them in the office or on the desk to maximize your usable kitchen space. The cooking zone will be centered around your stove and oven. This is where you would want to keep pots, pans, baking dishes, cooking utensils, spices, and pot holders. For some of you, your food prep zone and your cooking zone will blend together. In my kitchen, I do not have enough counter space next to the stove, so my food prep zone is on another counter. This is where I keep rubber spatulas, measuring cups, mixing bowls, knives, cutting boards, and all the other tools and utensils that I don’t use at the stove. The cleaning zone will be at the sink (and dishwasher if you have one). Obviously, this is where you would find dish soap, sponges, dish cloths, steel wool, cleaning solutions, etc. Food products should be kept separate from these items to prevent contamination. If you have a pantry, that’s the food storage zone (in addition to the fridge/freezer). If not, this one is a little tricky. You can use some of the cupboards in other zones to store food. Try to keep all your food in cupboards that are clustered together. Having to walk from cupboard to cupboard to gather ingredients wastes time. Another option is to use a free-standing cabinet or bookshelf in an adjacent room. This is how Kimiko stores food in her pantryless kitchen--keep an eye out for that post. If you have limited space, the serving/staging/storing zone is most likely the one that will have to be put in another zone. This is the area where I plate food, transfer food to serving dishes, put leftovers from those serving dishes into plastic containers, and put the food out when serving buffet style. The cupboards and drawers in this zone contain my dishes, serving dishes, cutlery, and plastic containers. Third, when organizing your kitchen, be willing to get rid of things. I recently got rid of all the random mugs we’ve collected over the years. Our dinnerware set came with mugs that match and we have plenty of them. Also consider getting rid of kitchen gadgets and tools that are limited in their uses or perform a task that can be done with another tool. 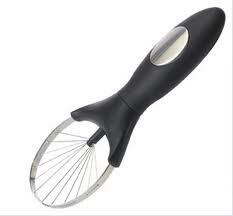 For example, I’ve seen avocado slicers at the store. A knife and spoon will do just fine without adding extra clutter to the drawers. Lastly, step back and evaluate your kitchen’s organization every couple of years. As you get rid of, lose, or break things and get new items, you may find that your once organized kitchen is now in need of an overhaul. Over the last few years I’ve gotten more place settings of my dinnerware so we could host both families for holidays and everyone could have a plate. Consequently, I needed to rearrange my cupboards to accommodate the extra plates, bowls, and cups. Be sure to check back next week when I share specifically how I set up the zones in my kitchen. A couple months ago, Sumiko posted a recipe for cheese lasagna. For a while, I didn't make lasagna, because 1) I don't like ground meat and 2) most recipes I found called for ricotta cheese and it just never tasted right. I recently got brave and decided to try lasagna again because my husband likes it. I read many recipes online, trying to find the perfect one. As always, I couldn't decide which one to try, so I took bits and pieces of each recipe, along with my own ideas and combined them into one recipe. This time, I used cottage cheese instead of ricotta and it was great! I was excited that it actually turned out and my husband likes it! Of course, I can't vouch for it, because it still has ground meat in it, but I'll share my favorite vegetarian version another time. I must apologize in advance for the lack of pictures. In a large skillet over medium-high heat, cook onions, turkey or beef, and sausage. Cook until onions are soft and meat is browned. Drain off fat. Add marinara sauce. In a separate bowl, combine cottage cheese, garlic, and oregano. Adjust seasonings to suite your tastes, then add eggs. In a 9 x 13 dish, place a layer of meat sauce, a layer of noodles, 1/2 cottage cheese mixture, 1/3 cup mozzarella, noodles, meat sauce, noodles, cottage cheese mixture, 1/3 cup mozzarella, and noodles, then top off with the remaining meat sauce and 1/3 cup mozzarella. This looks different, because it is half vegetarian and half meat. Cover with foil and bake for 1 hour. Remove foil, sprinkle with cheese, and bake for an additional 10 minutes. This is great served with garlic bread! If you'd like to make it ahead of time, you can assemble it and refrigerate it until ready to bake. However, be aware that it will take a little longer to bake since it's going to be cold when you put it in the oven. Additionally, lasagna is freezable! It can be frozen either before or after baking. Freezing it after it is baked reduces prep time when you are ready to eat it but produces a slightly over-baked pasta. You can compromise and bake it half-way before freezing it. Sumiko prefers to freeze it unbaked. She just moves it from the freezer to the fridge one or two days before she's ready to bake it. However you decide to do it, be sure to wrap it well to prevent freezer burn. Sumiko usually wraps it with two layers of plastic wrap and then a layer of foil (be sure to remove the plastic wrap before placing it in the oven). *These instructions were taken from Sumiko's cheese lasagna post here. *I've recently been able to get sliced mozzarella from the deli for $1.99/lb. I've found that sliced mozzarella works great too! Simply place a layer of mozzarella slices in place of shredded cheese. 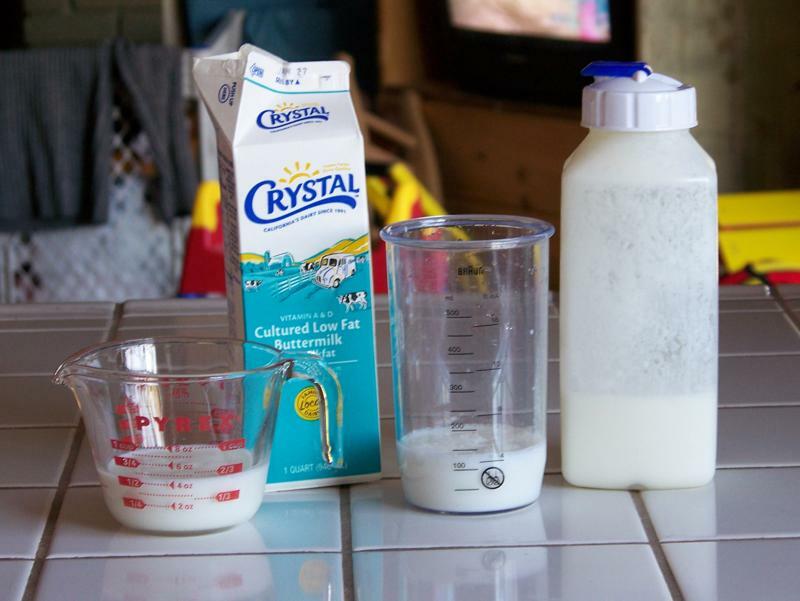 There are so many delicious recipes out there that call for buttermilk. I hardly ever buy it, however, because it is so expensive. 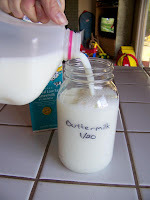 Last week one quart of buttermilk on sale at WinCo cost one dollar. One dollar doesn’t seem like much, but that’s $4 per gallon! 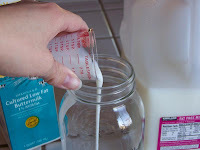 Consequently, I usually substitute sour milk. That all changed about two weeks ago. I was attending a women’s event at my church when one of the ladies, Suzy, mentioned that she had made Kimiko’s corn bread. She went on to tell me that she used homemade buttermilk and said it is really easy. I was shocked because I had previously looked it up in a cookbook I have and it was really complicated. The next day I started my own batch of buttermilk. 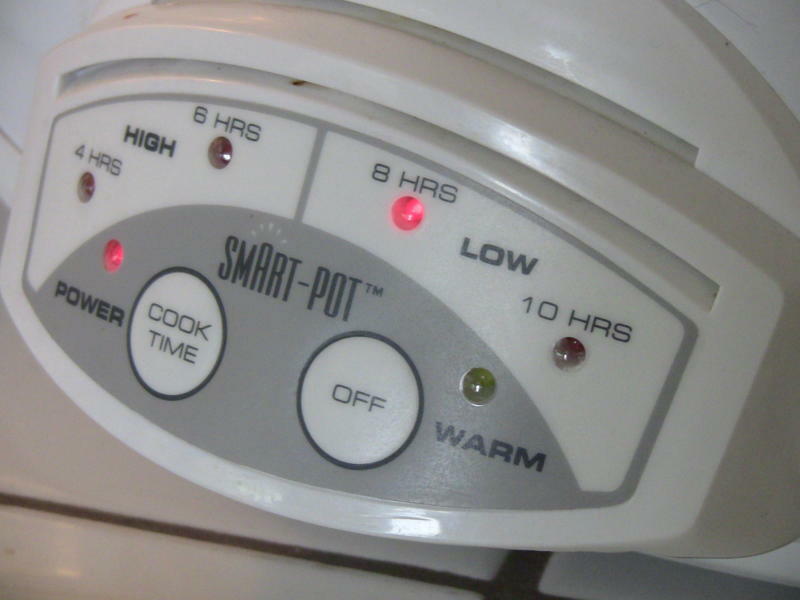 I have since used it to make pancakes, buttermilk biscuits, and dumplings. Thanks to Suzy, my baking has been revolutionized! Like she said, it’s really easy! 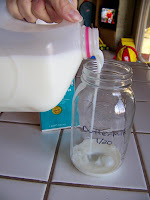 Originally, the term buttermilk referred to the liquid leftover after making butter. 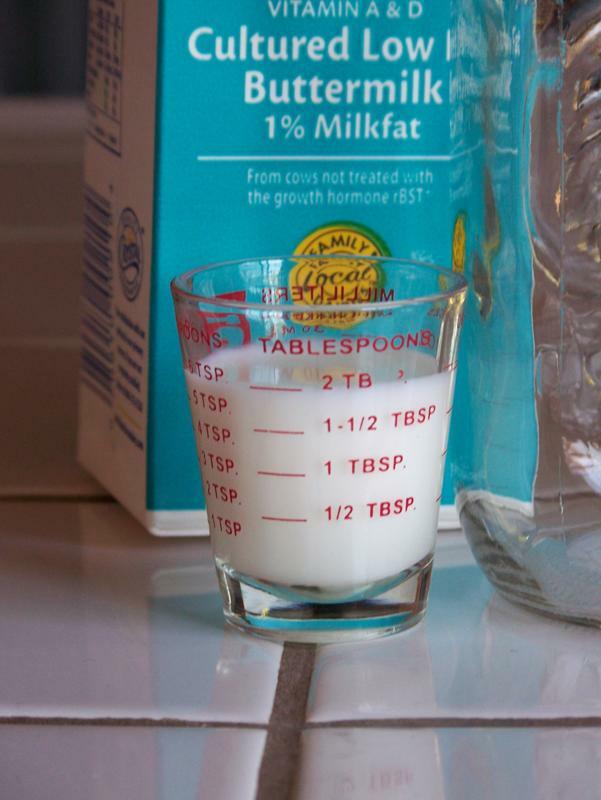 Today, buttermilk is milk that has been cultured with bacteria. 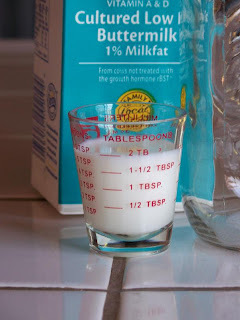 You do need to buy some buttermilk to start out, but once you start, you can just keep replenishing what you have with milk. That means this buttermilk costs the same as milk! I made one batch with skim milk and another with 1%. Both turned out great. Don’t let this recipe scare you just because you leave it out of the fridge for two days. If you keep it in a sealed container and then store it at proper fridge temperatures once it is cultured, it will be perfectly safe. The starter bacteria reproduce rapidly. 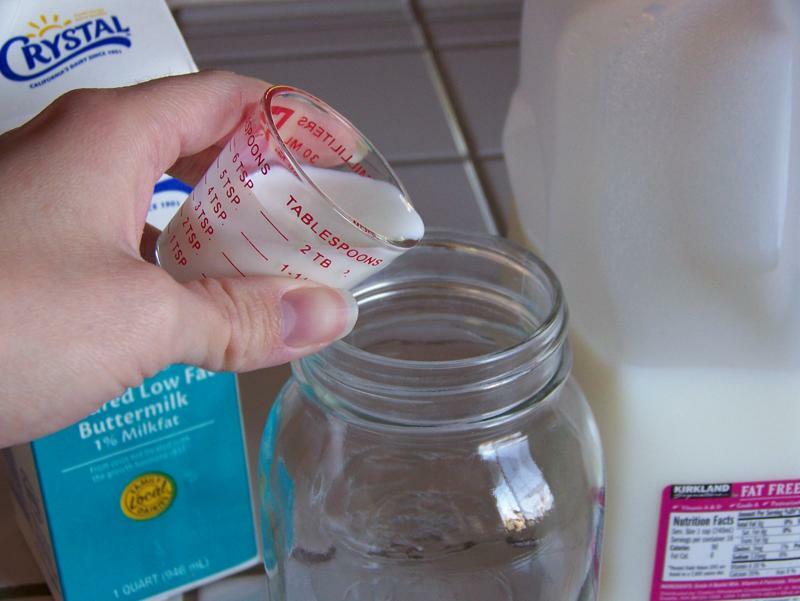 As long as you keep your milk and buttermilk free from contamination, those good bacteria will prevent bad bacteria from thriving. 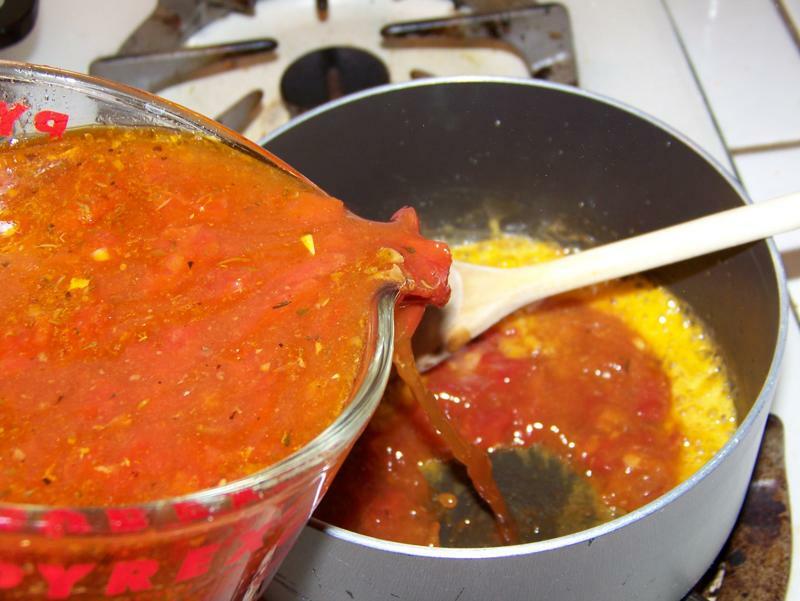 Of course, you should discard any batch that turns color or develops an odor. 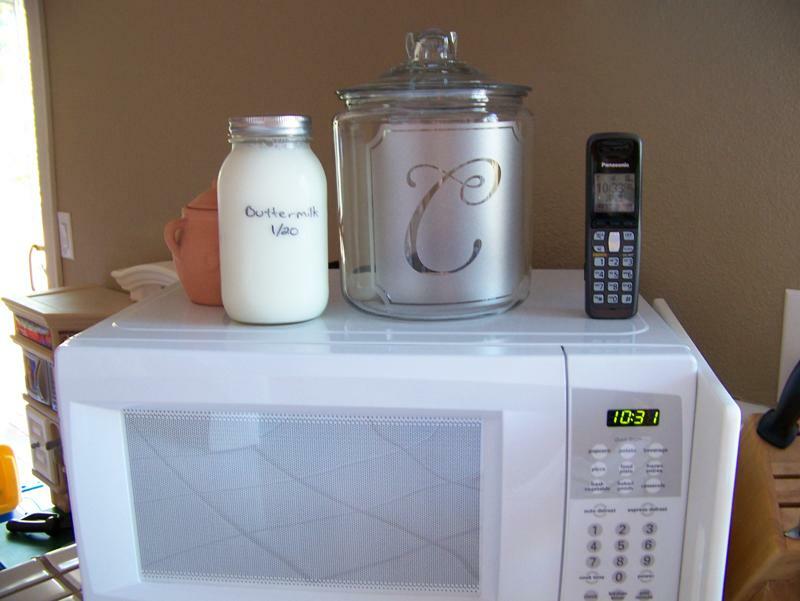 My buttermilk is culturing on the microwave. 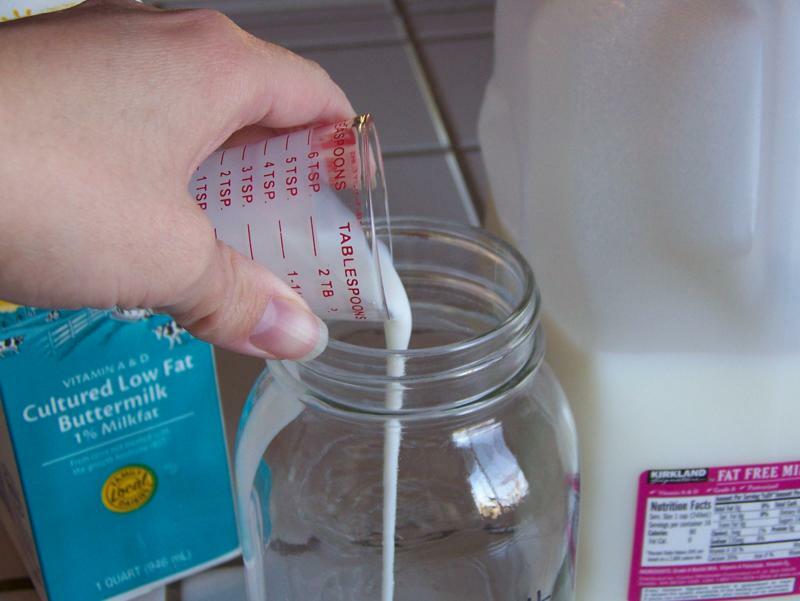 Be sure to shake or stir your buttermilk before using it. This homemade version is a lot thicker than the store-bought kind but still substitutes cup for cup. 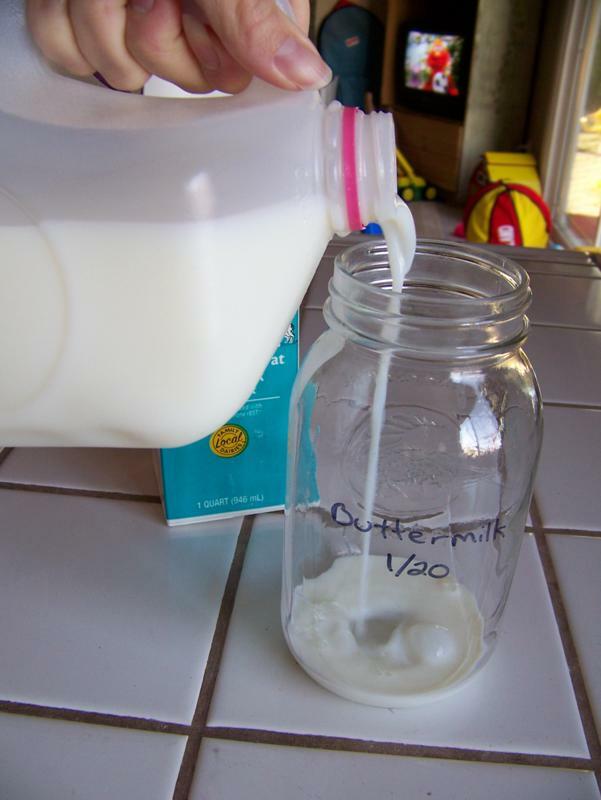 Combine buttermilk and milk in a 1-quart container. Shake to mix. Leave out at room temperature for 2 days. Refrigerate and use as needed. When you run low, start over again with 2 Tbsp. of your homemade buttermilk or simply add more milk to your container. I just added more milk to start over. Yield: 1 quart. 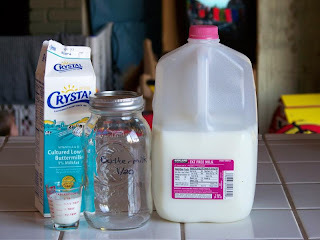 Total cost: the cost of your milk; for me, about $0.50/quart or $2/gallon. Hurry! This Deal's Only Good TODAY! TODAY ONLY, LivingSocial is offering $20 Amazon.com gift cards for $10! That's pretty much like getting free money! Amazon.com sells almost anything you need or want, including kitchen items. If you're considering getting any appliances, utensils, dishes, cookware, etc., this may be a great (and economical) way to do it! Just go here and purchase your gift card. Where I live, we have a restaurant chain called Chipotle. We don't go there often, but when we do, I enjoy getting their Barbacoa burrito. It's shredded beef that is just bursting with deliciousness! I was excited when I found a recipe that was similar to Chipotle's barbacoa beef and, oh my, is it tasty! In a blender or food processor, combine vinegar, lime juice, chipotles, garlic, cumin, oregano, pepper, salt, and clove. Process until smooth. Cut roast into 5 or 6 pieces. 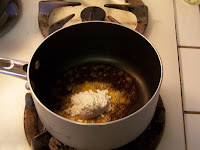 Heat oil in a skillet (preferably cast iron) until very hot. Carefully place the meat into the skillet and sear on each side for a couple of minutes. You're not cooking the meat here, just trying to get a nice sear on all sides. 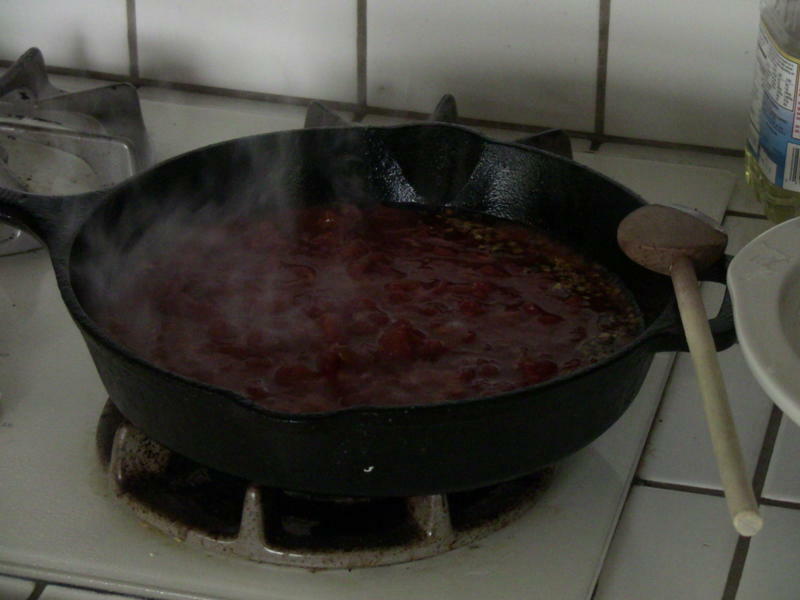 Your pan needs to be really hot to get a really good sear. I recommend using cast iron for this. 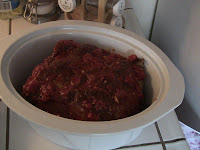 Once the meat has been seared, place it in the slow cooker and pour the chipotle mixture over the top of the meat. Place a couple tablespoons of water in the pan/skillet you used to sear the meat and deglaze the pan (heat the water in the pan, scraping the bits of meat that have been left behind). 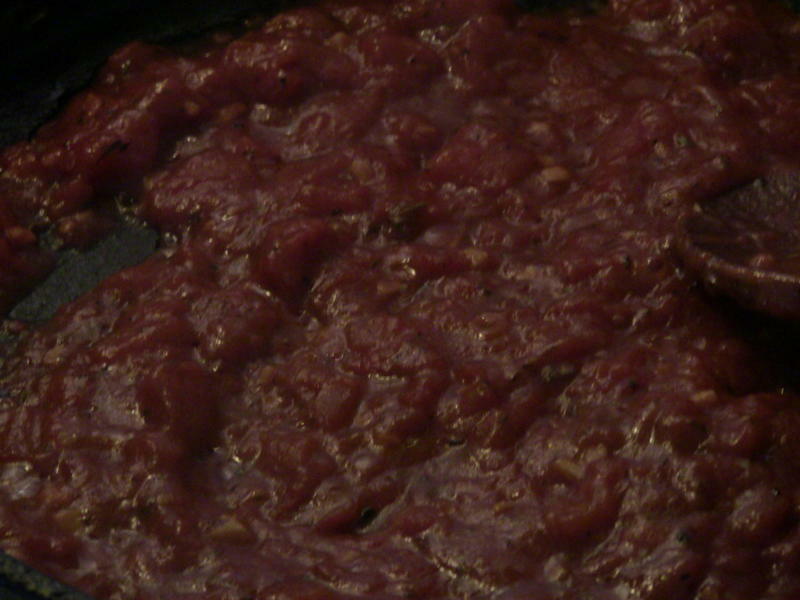 The drippings left in the pan after searing the meat are full of flavor! 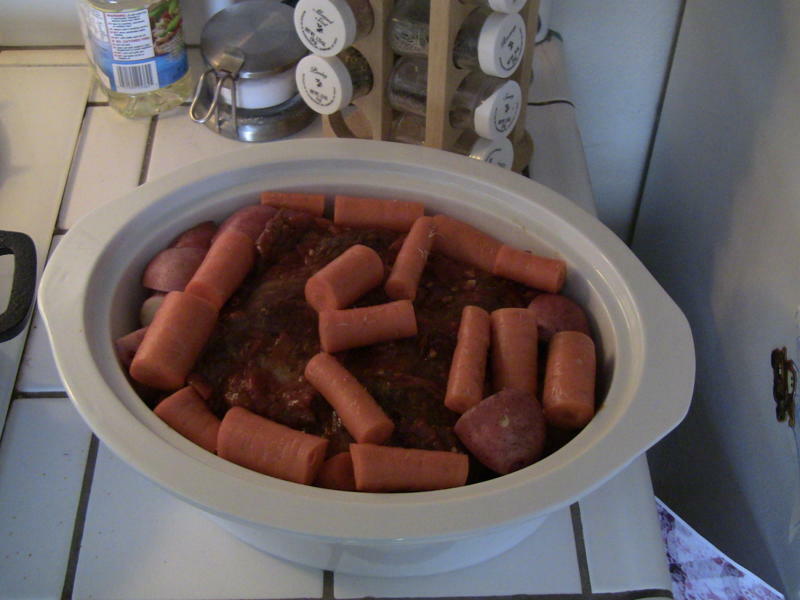 Pour the contents of the pan into the slow cooker with the meat, along with 3/4 cup water, 3/4 tsp. chicken bouillon, and bay leaves. Cover and cook on low for 5 hours or until meat is tender. Once meat is done, shred it, and place it back into the slow cooker with the juices. Serve in burritos (or tacos) with pico de gallo, rice, beans, and any other desired toppings. Suggested toppings: cheese, rice, pinto beans, pico de gallo, guacamole, hot sauce, sour cream, olives, lettuce.